In 1921 NSW had over 2,000,000 humans and less than 30,000 motor cars – about one for every 70 folk. Long distances were traversed by rail. Rail aided development. Closer settlement was the cry. Large sheep stations were being transformed into small holdings, usually wheat farms. The population grew rapidly. The gold towns of the southwestern slopes and northern Riverina developed their now familiar main streets in the 1920s. They now serviced farmers, shearers, railway workers, and agricultural labourers, rather than miners. Soldier settlers battled with the bush. Victorian farmers migrated north from holdings that had proven too small. Many supported a new state – Riverina. Along the rail lines, away supporters filled special trains to attend Maher Cup matches. When the away team played on Wednesday nights, and when victorious, the locomotive horns would cut a victory blast through the wintry night air as the players and fans returned home. Farmers along the tracks waited for the sound. The townspeople abandoned their evening activities to rush down to the station to meet the train and begin a hearty night of celebrations. Train steaming over the Murrumbidgee at Gundagai. In 1920 the railway infrastructure was in place for the Maher Cup to commence. The Main Southern Line was the backbone. Finished back in 1883, it run from Sydney through Yass, Galong, Harden, Cootamundra, Junee – all the way to Albury and then all change for Melbourne. 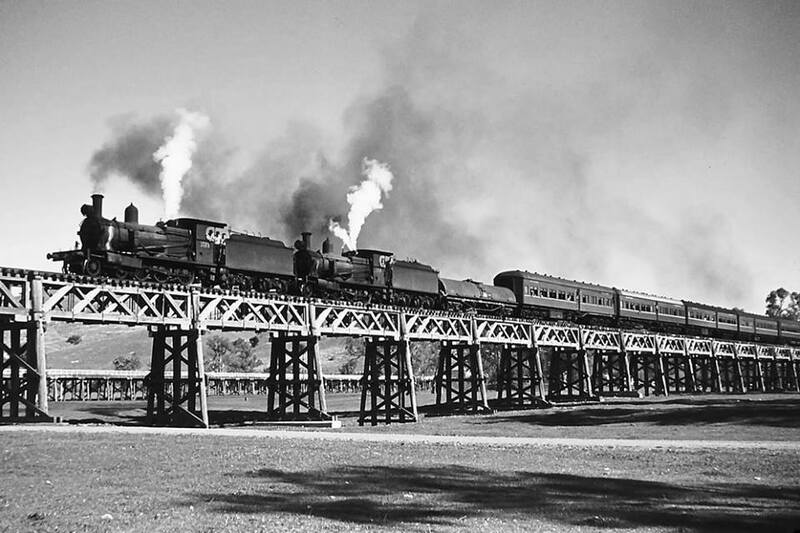 The line linking Harden (at Demondrille) to Cowra was opened in 1886, the Grenfell branch line in 1901, Cootamundra to Tumut in 1903, Cowra to Canowindra in 1910, Stockinbingal to Caragabal as well as Temora to Griffith in 1916, and the line north west from Wyalong to Lake Cargelligo in 1917. 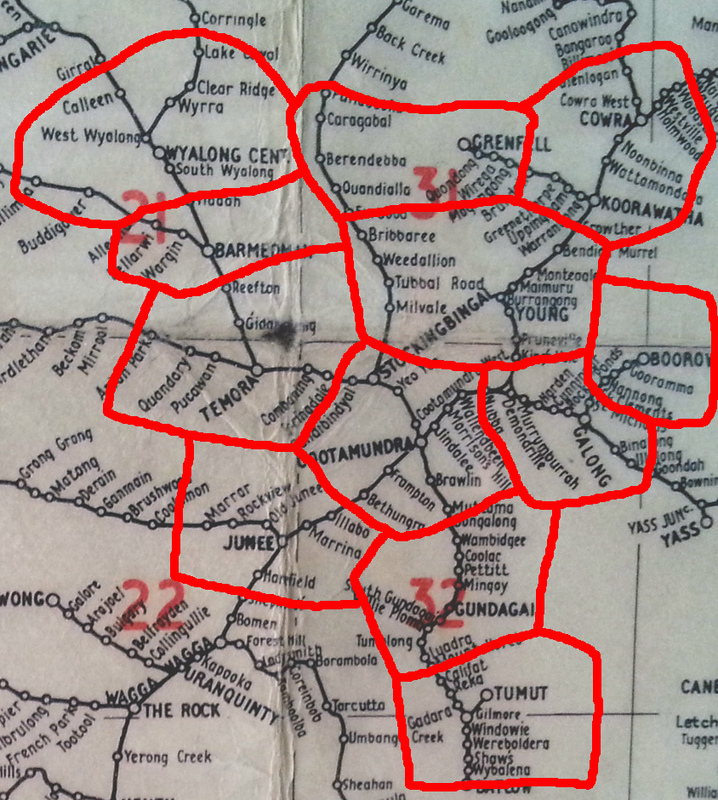 All the mapped lines above were in place except the Tumut to Batlow line and the one west from Barmedman through Tallimba, terminating at Rankins Springs (both 1923). NSW Railways Network Map from 1964 photographed from the wall of my neighbour’s place. This entry was posted in Demography, Communications & Media and tagged Maps, Railways. Bookmark the permalink. Hi Keith. Its a pleasure. It must have given you great satisfaction in scoring two tries in beating Young 35-2 in May 1965. There are couple of team lists that are incomplete as the Advocate didn’t publish them at the time. Perhaps you may be able to fill some gaps. In the Wyalong v Coota game on 4 June 1966 at Wyalong (sorry Coota won 14-0) I’m missing 6 players: I know the following were in the team Ron Budd, Arch Hetherington, Graham Steele, Peter Broad, Bruce Scriven, Ron Cooper, Jim Huggett – the six others would have come from the rest of the squad which was Ken Malligan, Geoff Pereira, Keith Kearns, John Wells, Rod Pilon, Ray Hately, Kevin Steele, Ray Barrington, Barry Duncan, Bill Butcher, and John Hetherington. Similarly in the 5 August 1967 challenge which Wyalong won 27-10 I’m three short: Ron Budd, John Wells, Ray Steele, Kevin Steele, Graham Steele, Ray Barrington, Bruce Scriven, Barry Duncan, Neville Ison, Bob Broad…+ 3 more. And I only have a few names from the Barmedman side. I know its a long shot but thought you might have some programs. Cheers Neil 0448440110. Hi there – Bruce Scriven passed away today. He was a great man. The Scriven’s are great friends of my family. Back in 1983 we won a minor league GF for West Wyalong against Forbes. We had Anthony Scriven (Bruce’s son and my good friend), Brett Hetherington (Arch’s son who played NRL). I think Matt Rodwell (NRL player) played as well. It was only U12s but great fun.